A partial post-mortem examination on a sperm whale which beached at Streedagh in Co Sligo has shown no evidence of plastic ingestion in one of its four stomachs. 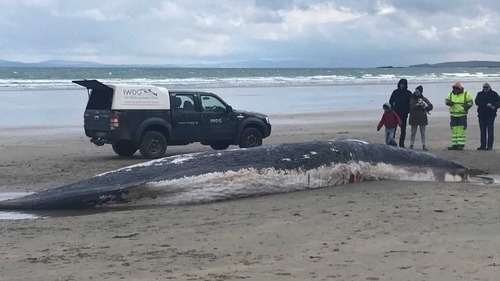 The whale, which is about 12 metres long, is one of three which washed ashore from counties Galway to Donegal in the past week. A possible fourth dead sperm whale was spotted offshore. The Irish Whale and Dolphin Group said it hoped that testing of some of the samples taken from the animal today would help to tell how it died and if, for example, it was caused by a disease targeting sperm whales. Sean O'Callaghan, Science Officer with the IWDG, said there was no evidence the whale had been struck by a boat or had any interaction with fishing. He said it was unusual for three sperm whales to be washed up in the north west, and one spotted dead a good distance out to sea, in such a short time frame. The IWDG was assisted in its examination of the whale at low tide by staff from Sligo County Council with diggers used to move the whale. It was not possible to examine all of the whale's stomachs as the tide was coming in and preparations had to be made to bury it. A deep hole was dug and quick lime used in the burial of the whale on the beach. Last August and September, 30 mostly beaked whales were washed up in the west and more were beached in Scotland. An investigation is ongoing into the cause, with noise pollution, specifically military sonar, being looked at. On Sunday, a sperm whale was discovered washed ashore in Mace Head near Carna in Conamara, Co Galway. Last week, another sperm whale was washed up at Magheroarty in Co Donegal. In the deep waters to the west of Ireland, sperm whales are widespread and rarely occur in waters less than 300m deep. Postdoctoral Researcher in Marine Conservation Planning in the School of Geography at NUI Galway, Patricia Breen said clusters of stranding’s of this kind is relatively uncommon in Irish waters, however she said they have happened elsewhere in recent years, such as the mass stranding in Dutch and German waters in 2016. Ms Breen said there are many hypotheses behind why these events occur. She said natural factors such as biological diseases or impairment of navigation systems which result in animals getting ‘lost’ may cause strandings. She added that human related factors, especially in mass stranding events, could not be ruled out. Ms Breen said sperm whales are incredibly sensitive to noise, therefore activities such as the use of military sonar or seismic surveying for oil and gas deposits which introduce man-made noise into the sea will affect sperm whales. In the past sonar from Royal Navy submarines traversing Irish waters has been blamed by some for whale beachings. The noise causes them to swim away from the sonar source and change depth, which disrupts their feeding patterns and can cause death and strandings. Ingestion of plastic in the oceans is also seen as a major factor, a dead whale found off the coast of Italy recently had 22kg of plastic in its stomach.